One Santa . . . Separated at Birth? Looking up some images from Eric Carle the other day, I came across this one. Very nice. If you took away the signature hat — put on a fedora instead — it would almost look like any number of dads out doing some winter shopping. I had this idea: Wouldn’t it be cool to throw together a bunch of different Santas, all drawn by different illustrators, ranging from Jan Brett to James Marshall to Jerry Pinkney to Matthew Cordell, and on and on? You know, look at them, enjoy the differences, let that holiday spirit sink in a little. But, you know, I don’t have a scanner, it would take too much time, I’m recovering from an ear operation (! ), and it’s just not going to happen. So let this Santa suffice, beautifully painted by Eric Carle. That’s him, right?! 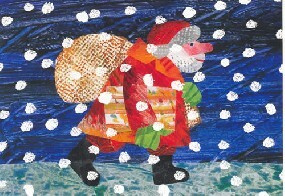 Eric Carle and Santa Claus — separated at birth.